Alfred Estoche Lim and his wife Socorro. Photograph by Liliam Lim. Filipino-American war veteran Alfred Lim has died at his California home aged 107 after a remarkable lifetime of service to family and country. The highly decorated soldier served behind enemy lines in the Japanese-occupied Philippines, specialising in demolition jobs. Despite his experiences, he later contributed towards efforts to honour those Japanese Americans who had been wrongly interned during the war years. Although a man of little formal education himself, his work ethic and self-sacrifice saw all four of his children graduate from prestigious institutions to pursue successful careers in law and business. Alfred Lim was born on July 17, 1911, in the town of Jaro in Iloilo Province. His mother died when he was 12 years old. Then, while still a young teenager, his father sent him to Hong Kong and Southern China, where he learned to speak Cantonese, his fourth language after Visayan, Tagalog and English. When he turned 18, Alfred moved to California where he worked as a houseboy, chauffeur, farm worker, professional boxer and a US Navy civilian storekeeper. In 1942, at the age of 31, he was inducted into the US Army and eventually became part of the famed First Filipino Infantry Regiment. He was first sent to the Monterey Language School to learn Japanese and then to Australia for further training. Alfred then volunteered to return to the Philippines and assist his countrymen in their resistance to the Japanese occupation. In 1944 he was landed at the dead of night by submarine. With him he brought medical supplies, weapons, explosives and a message of hope to the Filipino people. Upon arrival, he teamed up with the Filipino guerrilla movement and moved to a base of operations in the mountains. As part of a unit of six, he specialised in the demolition of strategic targets including bridges, truck convoys and military headquarters. Sergeant Lim, as he then was, also gathered intelligence on Japanese troop movements as he, along with 500 fellow Filipino American volunteers, prepared the islands for liberation. More than 80 of these men paid the ultimate price for their bravery. The resistance movement included a young Lieutenant called Ricardo Toribio, who was an aide to General Alejo Santos. The Toribio family hid American soldiers and munitions in their home. It was during this time that he first laid eyes on Socorro Toribio, who, after the liberation, became his beloved wife of 73 years. Among the medals to have been pinned upon Alfred’s chest were the Liberation Medal, the Bronze Star with V for Valor with Oak Leaf Clusters (nominated for the Silver Star) and a Presidential Unit Citation. Last year he received the General MacArthur Liberation Medal and the Congressional Gold Medal. 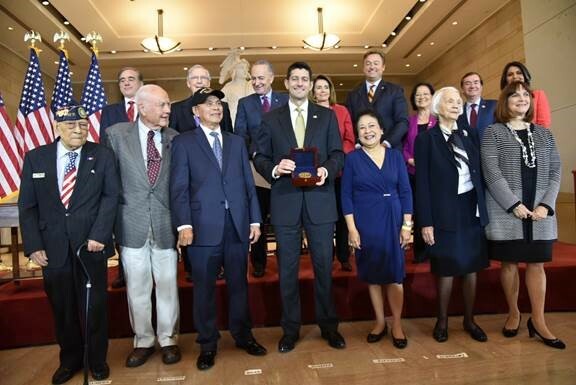 House Speaker Paul Ryan, Senator Mazie Hirono, Representative Tulsi Gabbard and Congressional leaders present the Congressional Gold Medal to Alfred Estoche Lim (far left) last year. After Alfred Lim was discharged from the US Army he became a civilian employee of the US Air Force in the Philippines, during which time his two eldest sons, Alfred and Jaime, were born. In 1948, the family returned to California, where two more children, Lillian and Chris, followed. Alfred spent the next three decades as a civilian employee at the Alameda Naval Air Station, working as an aircraft instrument technician. However, in his determination to give his children the best possible start in life he also worked second jobs as a TV repairman and security guard. Due to this work ethic and the sacrifices he shared with his wife, all of his children attended military academies and Ivy League colleges. They have all gone on to pursue highly successful careers in business and law. Despite his years of fighting the Japanese, Alfred inspired his children to help establish ‘Days of Significance’ in California and Hawaii in honour of Fred Korematsu, a Japanese American who resisted the wrongful relocation and internment of his fellow Japanese Americans during the war. Alfred Lim is survived by his wife, four children, eight grandchildren and seven great grandchildren. 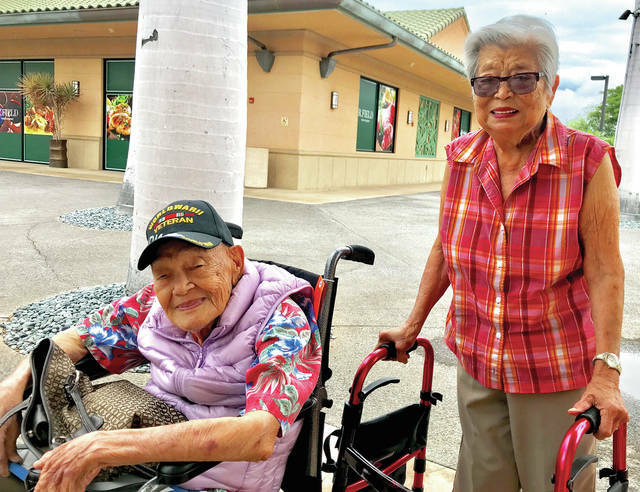 After a long life of service and sacrifice to family and (at least) two countries, Alfred Estoche Lim died peacefully in his sleep at his North Kohala home on October 12.